Though I’ve spent much of my first two Freaks and Geeks reviews focusing on Lindsay’s arc, she’s not the only one with an identity crisis on this show. As a story about adolescence, Freaks and Geeks is all about people in transition, particularly the Weir siblings, and “Tricks and Treats” is the first episode to actively highlight the parallels and differences between Sam and Lindsay’s respective journeys. As we’ve already seen, Sam is in many ways the opposite of his big sister. Whereas she’s tired of her old life and is looking for something new, Sam is afraid of change. To him, High School is big and scary and intimidating, and he’d much rather continue his “childish” pursuits like Star Wars than brave another terrifying game of Dodgeball. In episode two, when Lindsay decides to throw a Kegger, Sam is terrified, because it totally clashes with the calm childhood he’d been enjoying. As Lindsay tries moving forward, Sam tries moving backwards, and in “Tricks or Treats,” their paths cross in a devastating moment that forces both of them to adjust course towards the direction they’d been running from. Two seemingly insignificant events spark their parallel story arcs this time around: for Sam, it’s his English teacher assigning an alarmingly large ‘adult’ book – “Crime and Punishment” – and for Lindsay, it’s catching Millie kissing her ‘secret’ boyfriend. 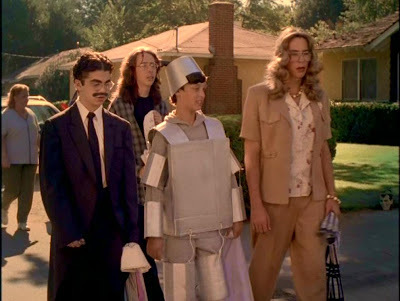 Earlier in the episode, both Sam and Lindsay had rejected suggestions for how to spend their Halloween: their mother prompted Sam to go Trick-or-Treating, while Daniel and Nick asked Lindsay to come out with them and Kim. Sam, trying to resist the lure of such a childish activity, insisted he wouldn’t trick-or-treat, and Lindsay, probably still reeling from her disastrous Kegger, turned down Daniel’s offer to be a good daughter and pass out candy with her mom. In short, both were trying to get away from the paths they’ve been walking, to do what they know deep down they probably should, but it only takes a minor stimulus to push them back in their original directions. “Crime and Punishment” reminds Sam of all the unappealing aspects of growing up, making the sweet, comfortable embrace of Trick-or-Treating that much more alluring, and though Lindsay isn’t usually a petty person, if Millie, of all people, has a boyfriend, then how can she possibly waste time at home handing out candy when she could again try impressing Daniel? The story doesn’t end well, of course – in fact, it’s probably the saddest ending of these first three episodes – but until the end, it seems like Sam and Lindsay both made good decisions. They each wind up having a great time, and for the audience, it’s easily the funniest episode so far. Writer Paul Feig mines a surprising amount of humor out of Trick-or-Treating; the early-eighties scare of razor-blades, drugs, and other undesirables being hidden in candy is a comedic gift that keeps on giving; all the costumes – from Harris’ blade-through-the-head to Harold Weir’s vampire outfit – get their share of laughs; and I found most of the Freaks’ destructive antics to be hilarious, from Mr. Rosso having a backup, fully carved Jack-O-Lantern on standby to Lindsay failing to properly destroy her assigned pumpkin, a scene that becomes funnier and funnier the longer it runs. 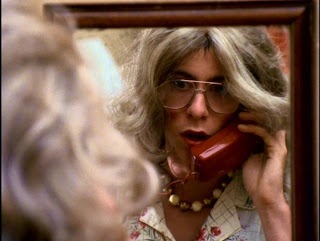 But the most riotously funny scene comes early on, as Bill dresses up as Jaime Sommers, the Bionic Woman, and examines himself in the mirror. At this point, I’ll probably have to devote a paragraph in each review to Martin Starr’s comedic brilliance, but boy is that scene just sidesplittingly funny on every level. “I’m sorry Steve Austen, I can’t marry you…” “Wait, I’m gunna put the phone on my Bionic Ear…” “No, these are not bionic, these are all me…” God. Damn. 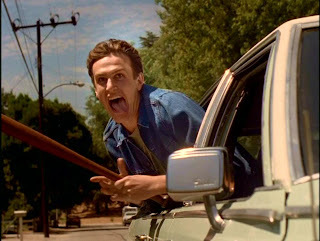 For a teenager, Starr had a remarkable sense of comic timing that rivals most adults, and the only downside to watching this perfect little scene is that it once again makes me sad that Starr hasn’t become a bigger player in other Apatow productions (though his supporting role in “Knocked Up” is a hoot). As the hour moves along, and things become looser and funnier, Lindsay and Sam both reach a point where it seems that they’ve made good decisions. Lindsay is having a great time with her new friends – and has even gotten Kim to begrudgingly accept, maybe even admire, her presence – and Sam, Neal, Bill, and Harris have had a successful candy run, one that’s put “Crime and Punishment” far back in Sam’s mind. But Sam, unfortunately, is even more out of his depth than Lindsay is, and his Trick-or-Treating attracts the attention of bully Alan, who steals the group’s candy. Sam seems to be at his lowest, and after smashing some mailboxes and starting an egging run, Lindsay seems to be at her highest. It’s exactly the wrong time for their paths to cross, but cross they do, as Lindsay and Kim egg the nerdy group of kids they see while cruising down the block. A moment too late, Lindsay realizes she’s egged her little brother, and in this fleeting second, both of our main characters’ worlds come crashing down, and the episode takes a harrowing turn into much darker territory. 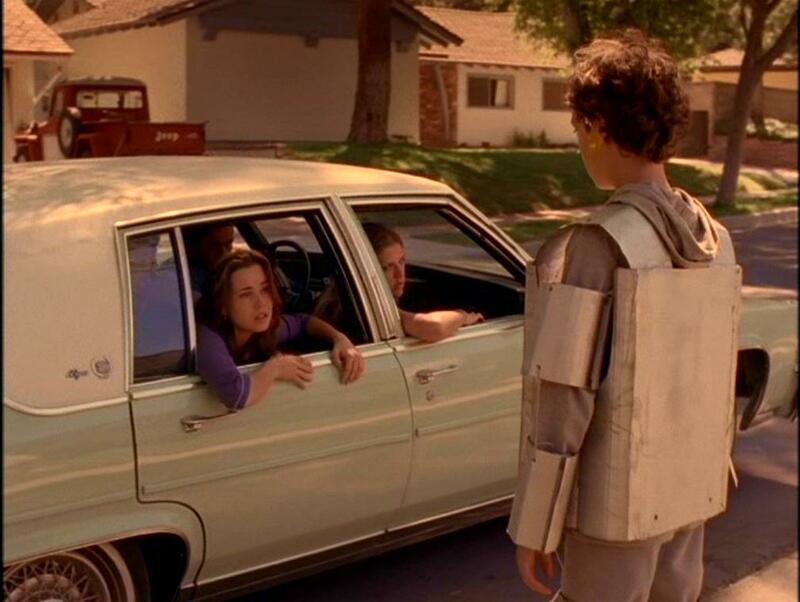 John Francis Daley and Linda Cardellini are so utterly fantastic in this scene. Daley portrays Sam’s heartbreak and anger with piercing precision; looking into his eyes, it’s like a part of him – his childhood, perhaps – has just died, never to return. Cardellini is just as good illustrating Lindsay’s incredible regret; after a fun afternoon wreaking havoc with her friends, she’s suddenly and violently been brought back to reality, and you can see the pain of realizing what horrible things she’s been doing etched in her very being. They both head home, their visions of a fun, care-free Halloween ruined; Sam proves he’s the bigger man in all this by not ratting Lindsay out to their parents – even as he still finds room to stealthily throw a few choice words at her – and both characters wind up right back where they started, Sam with “Crime and Punishment,” Lindsay handing out candy with her mom in an adorkable ‘little prince’ costume. Try as they both had to run away from their responsibilities, neither made any real headway, and all they got out of the experience was extra pain and confusion. There is, at least, a silver lining for Lindsay, though she’d probably be the first to admit she doesn’t quite deserve it: passing out candy with Mom turns out to be fun and cathartic. Sam doesn’t find any such solace. 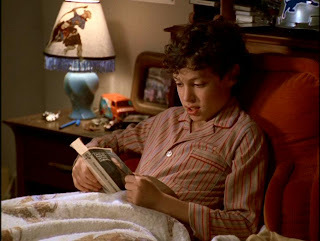 He retreats to his room to read “Crime and Punishment,” and when his father asks him if it’s any good, Sam replies that he doesn’t know yet. “Everyone’s name is really weird and long.” It’s a metaphor for growing up, for the adolescence Sam has been running from. After his disastrous Halloween, Sam can no longer cling to illusions of childhood, and taking a crack at “Crime and Punishment” represents his first conscious steps towards growing up. He doesn’t know if he likes it yet, just like any confused adolescent. 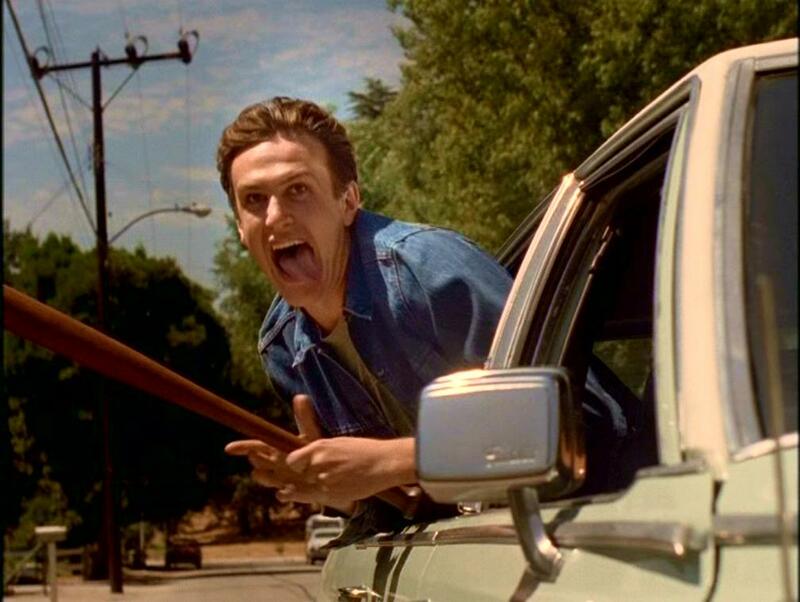 It’s a sad, contemplative, and brutally honest ending, but that’s what makes Freaks and Geeks special. Any other series would have let Sam hold onto his childhood for at least a little while longer, but this is a show that doesn’t pull any punches. As funny as much of “Tricks or Treats” is, the ending packs one hell of an emotional wallop, one every viewer will certainly relate to, and leaves us questioning where these characters are going to go from here. Is this going to jade Sam, making him destined to eventually head down a similar road as Lindsay? What will Lindsay do now that her adventures with the Freaks have ended in heartache two episodes in a row? 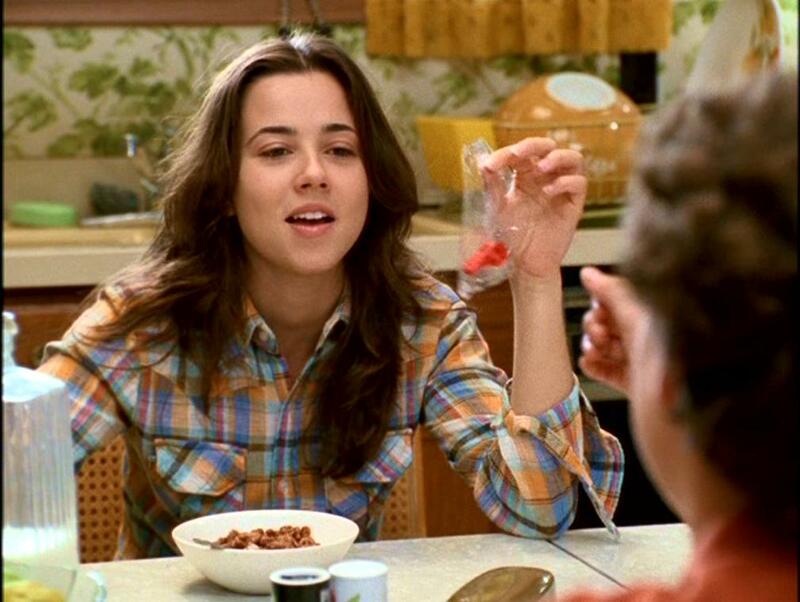 Are the Weir siblings going to be able to recover the casual camaraderie they shared in the opening scenes, playfully arguing over who gets the prize in the cereal, any time soon? Those are some pretty hefty questions for episode three, and none of them have easy answers. Wherever things go from here, they are sure to be fascinating. --This is the first episode to really flesh out the Weir parents, Jean, the mother, in particular. Her arc in this story is one that definitely rings true, struggling to know how to treat Sam now that he’s growing up, and feeling lost without Lindsay by her side on Halloween. A lot of the material with Jean is spectacularly well observed, from her being so enthusiastic about Halloween that it’s embarrassing, to her awkward meeting with Sam’s strange friends. I think many viewers can see at least a little of their mothers in Jean, and turning her into such a recognizable supporting character this fast really helps to deepen and authenticate the show’s universe. --Harold Weir, meanwhile, is just very, very funny from start to finish, his hatred and confusion of Halloween making for a reliable running gag. --The teaser, with Bill winning ten dollars by drinking a disgusting shake filled with whatever terrifying foods Sam and Neal could find, is maybe the earliest example of the fine, patented, Apatow-brand gross-out humor that has been perfected and fine-tuned over the last decade. --Millie’s two scenes in this episode cracked me up, from the dorky candy she’s eating at the bus stop to explaining emphatically to Lindsay that “he’s my secret love!” when Lindsay catches her with a boy. --The scene at the bus stop also gives us further hints about Daniel’s darker side; while Kim mocks Millie mercilessly, Daniel takes a taste of the candy in a moment that could easily be interpreted as putting the ‘moves’ on Millie to defuse the tension. Millie shyly smiles after he complements the candy, after all, and the entire scene feels like a number of other sequences where Daniel has calmed things down by causally flirting with Lindsay. Daniel obviously isn’t interested in Millie, which, of course, and if I’m reading his behavior right, that doesn’t bode well for Lindsay’s affections. --One of the subtle ways Lindsay and Sam’s stories are connected is using the song “Gonna Raise Hell,” by Cheap Trick, in scenes with both characters, first in a montage as Sam and his friends get their costumes ready, and later as the Freaks get ready to do some damage. An episode so dark and ahead of its time that back in 1999, NBC refused to air it. I noticed a historical inaccuracy in this episode. When Daniel pulls up to the bus stop he's driving a (1979 to 1981) Pontiac Trans Am. The car is very rough with totally faded paint, primer spots and an engine block in the back seat. It looks like an OLD worn out car. If this was supposed to be 1980 then he was driving a car that was at most one year old. It should have looked like a new car. They should have put him in a 1970 Trans Am which would have been much more believable for the condition of the car.